1. The Kentucky Derby was first run on Monday, May 17, 1875, the first ever day of racing at the track that would become known as Churchill Downs. The Derby, then run at 1 1/2 miles, was the second of four races on the program. Interestingly, another race on the card was for horses of all ages run in one-mile heats (a horse named Fair Play won two of the three heats). The inaugural meet lasted just six days, ending on May 22. 2. The Kentucky Derby is, of course, a "spin-off" of the famed Derby Stakes, which was first held in 1780 at Epsom Downs outside London, England. Over the years there have been loose connections between the Kentucky version and the original, which is run over 1 1/2 miles on grass. The first horse to compete in both was Bold Arrangement, who finished second in Kentucky but only 14th at Epsom in 1986. 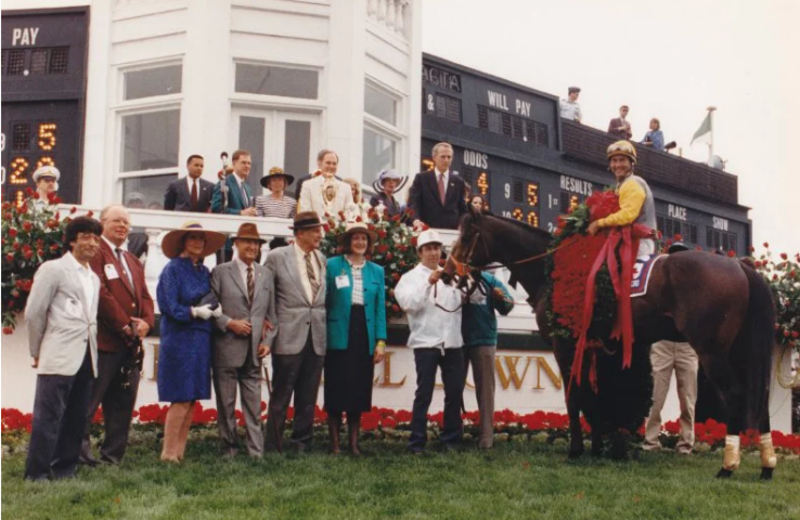 In 1992, Dr Devious was shipped from England to compete in the Kentucky Derby by his American owners. While he could only finish seventh in his first try on dirt, Dr Devious went back to England the following month and won the Epsom Derby by two lengths. 3. One of the most noted traditions of the Kentucky Derby is its position on the calendar. The first Saturday in May has been the Derby's permanent spot since 1938, but in 1945 the Derby was run on its latest ever date of June 9. As part of a final push to secure an Allied victory in World War II, racing across the country was banned that year from January until mid- to late-May. In an era when horses raced more frequently, all of the Derby contenders still managed to squeeze in one to three preps in the span of several weeks. A couple starters even circumvented the ban by prepping in Canada and Mexico earlier in the year. 4. Kentucky Derby success has spanned three generations only twice in the race's long history. Reigh Count (1928) sired Count Fleet (1943), who in turn sired Count Turf (1951). The other occurrence was Pensive (1944), who sired Ponder (1949), who in turn sired Needles (1956). The only Kentucky Derby winner to sire more than one Derby winner was Bold Venture (1936), the father of Assault (1946) and Middleground (1950). 5. Based on the most current information, the oldest living winner of a Kentucky Derby is Sea Hero, who won in 1993 and is 28 years old. Don Combs, the earliest Kentucky Derby-winning trainer still alive, saddled Dust Commander to an upset win in 1970 at age 31. Bill Boland is the earliest Derby-winning jockey alive having rode Middleground to victory in 1950 as a 16-year-old apprentice.